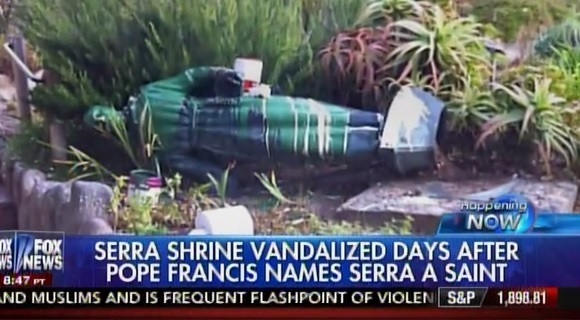 St. Junipero Serra’s statue was vandalized at the Carmel Mission in northern California on Saturday. This comes just days after Serra was canonized a saint by Pope Francis. Less than a week after Pope Francis canonized controversial Spanish missionary Junipero Serra in Washington, D.C., vandals damaged the saint’s statue at the Carmel Mission in northern California where his remains are buried, police said Sunday. The attackers also vandalized other statues and gravesites. The attack happened Saturday night and the vandals splashed white and green paint on the mission’s doors, Carmel Police Sgt. Luke Powell told the Salinas Californian, a local news publication. The vandalism happened on the eve of a ceremony at the mission to commemorate Serra, according to the Associated Press. Francis canonized Serra — a Franciscan friar — on Wednesday unsettling Native Americans who accuse the saint of being complicit in the killing of thousands of indigenous people and the destruction of their culture. However, his followers maintain that Serra worked as a moderating influence and welcomed the papal move, saying it was an act of acknowledgment of the American Church’s Hispanic history. The saint’s statue, along with other statues, was toppled and someone scribbled “Saint of Genocide” on a headstone, according to the Los Angeles Times. Here’s a photo of the statue before it was vandalized.